God Has Spoken But What Has He Said? Why do Christians disagree so much about what the Bible says? Is it possible to know whose views are right? Can the Bible really be understood at all? Answers to these important questions lie in the straightforward set of principles of interpretation developed in this book. The author uses many examples to show how to apply these principles. 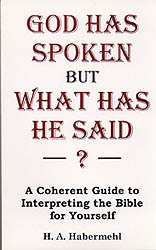 If you are searching for solutions to Bible problems, here is a book that will clear up your confusion and reaffirm your belief in the veracity of Holy Scripture. The author first lays out a set of principles of interpretation. These are: 1. The literal principle. 2. The context principle. 3. The progressive principle. 4. Understanding parables. 5. Biblical spiritualizing. 6. Types and symbols. 7. Prophecy. 8. The application principle. The author then discusses some controversial subjects; the subject of election versus free will, the millennium, and divorce, showing how application of the interpretation principles above can lead to arriving at conclusions. The emphasis is on the process by which conclusions are arrived at, not the conclusions themselves. As the author says, "It is my opinion that if we would reach agreement on these principles first, we would all come to the same conclusion." Price: $12 postpaid in U.S. See bottom of this page to order. Published by Antiphon Books, an imprint of The Harp and Dragon, 25 Madison St, Cortland, NY 13045, USA. Copyright 1995 by H. A. Habermehl, B.A.Sc. Edited by Anne Habermehl, B.Sc. Questions are invited by the author at the email address below. Please put an @ sign where the space is. This is to prevent spammers from getting this email address. To order this book, email the author at the above email address.